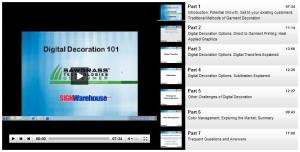 Recently, SignWarehouse and Sawgrass held our joint webinar, entitled Digital Decoration 101. The webinar was hosted by SignWarehouse Product Manager Jerry Barrax and presented by Sawgrass Manager of Consumer Education Jimmy Lamb. You can view the Digital Decoration 101 webinar here. This webinar presents an introduction to the opportunities in digital decoration. Jimmy shows how the use of digital decoration technologies can supplement a screen print or embroidery business. Digital decoration constitutes a great startup opportunity for someone looking for an inexpensive and efficient way to create custom imprinted gifts and apparel. Jimmy’s unique insights gained over 20 years in the business gave attendees new perspectives on how small format processes like dye sublimation, ChromaBlast cotton decoration, and heat applied graphics compare to things like direct to garment and screen print. Each option is presented objectively with its pros and cons so attendees can make intelligent decisions about the best choice for their businesses.